It’s autumn and pomegranate season in Sydney. I can see quite a few pomegranate trees as I walk round my suburb, with the over-ripe fruit splitting open and dropping to the ground. None of my local trees are conveniently located near the fence, so I haven’t been able to harvest any of my suburb’s bounty as I haven’t had either the chutzpah or opportunity to the ask the owners if I could pick some of their fruit. But even though this pomegranate was bought from my local fruit shop, it still feels nice to be eating pomegranates when they are visibly in season in my local area. I’ve been wanting to make this salad ever since the pomegranate season started but I had to wait for the cauliflowers to come on board. 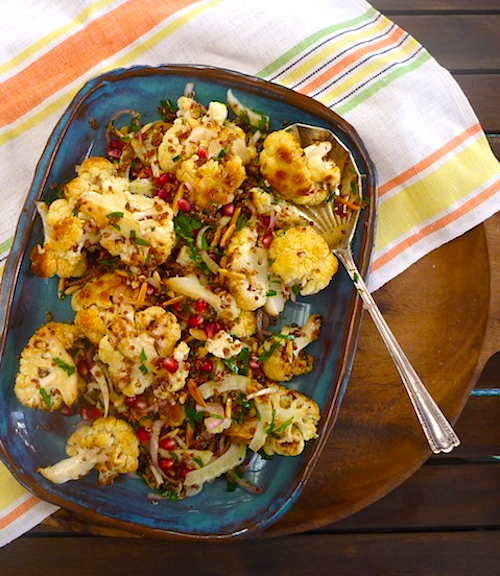 I think it was only last winter when I discovered how good roasted cauliflower is. I love cauliflower but roasting it seems to take it to another level, intensifying the flavour and creating delicious caramelised bits that you can scrape off your baking tray and eat. We ate a lot of roasted cauliflower last winter, particular this baked Manchurian-style roasted cauliflower from Nourish Me, which is spectacularly good. Manchurian cauliflower is traditionally deep fried but, if anything, I think it is better when baked. 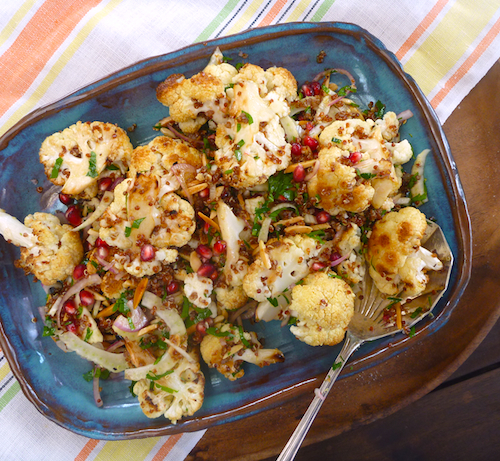 Then there’s this salad, which would have to have one of the most star-studded casts for any salad, with golden roasted cauliflower, fennel, ruby red pomegranate seeds and toasted almonds, all embraced with a sweet and sour pomegranate molasses dressing. It’s difficult to imagine how that could be bettered. The original recipe comes from Karen Martini, and she uses fine burghul wheat instead of quinoa, but the red quinoa does give this salad a spectacular dramatic accent, as well as making it gluten-free. This is a great as a side salad but if I want to make it more of a meal, I just add more quinoa. Note: If you find your quinoa is a bit soggy, here is my technique for cooking super fluffy quinoa every time. Preheat the oven to 175°C. 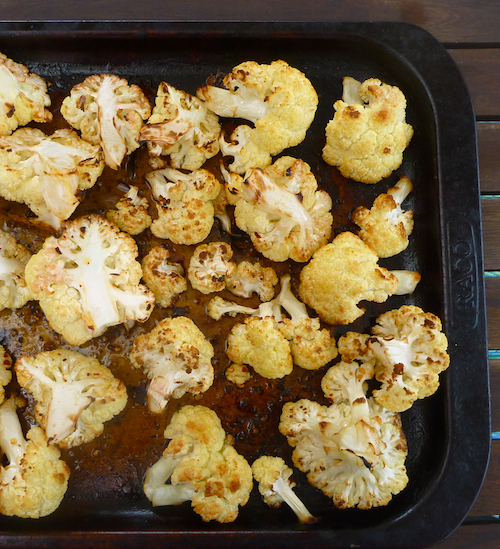 Oil a baking tray, sprinkle cauliflower with some salt, chilli flakes (optional) and verjuice (optional), and roast for 25 minutes, turning once until cauliflower is tender and golden in parts. Mix ingredients for dressing and rest for at least five minutes. 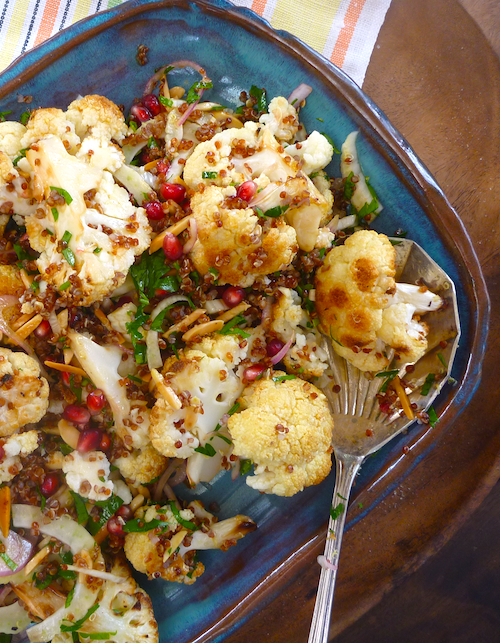 Combine, cauliflower, fennel, red onion, almonds, parsley, pomegranate seeds and quinoa (or burghul). Pour over dressing and mix gently. Let sit half an hour before serving. Yum! pomegranate is the key to my heart and this looks so fabulous! The pomegranate adds such a pretty pop of color to these! When they’re in season pomegranate is good to sprinkle over everything – they look so gorgeous.